Winston Churchill once said "I will not pretend that, if I had to choose between communism and Nazism, I would choose communism." 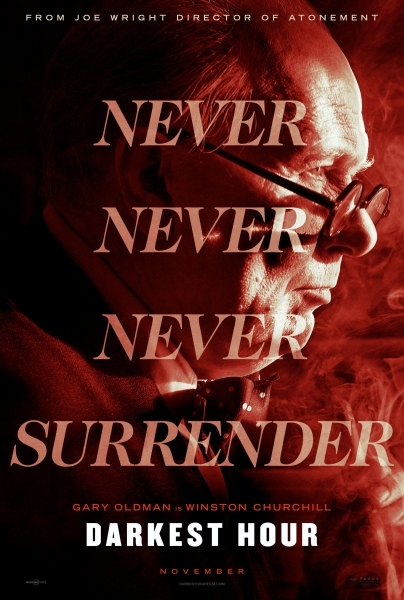 Today we often want to see Churchill, as the movie Darkest Hour tries to do, as the wall between freedom and fascism. But in many ways, he was just one of the forces to keep a kinder, gentler branch alive instead of Hitler's variety. An aristocrat born with a silver spoon in his mouth who opposed the freedom of India and promoted conservative values at all costs, Churchill stood for empire, for colonialism, for racism. Darkest Hour is an apologist's attempt to set him in a positive light, as a historically unique character whose eccentricity saved the world from a darker evil. And as propaganda it's brilliant. Director Joe Wright is a beautiful filmmaker. Although I often find his films on the boring side there is no doubt he makes beautiful movies. He has made one here. It's smokey and atmospheric. He chronicles Churchill's exploitative coup of the UK as a charmingly cute historical anecdote. It forwards the "great man" theory of history where the presence of a truly great individual changes the course of history. Yes he is shown to be exploited and used by those seeking power around him, but in the film's mind he is above all this and triumphs over it. It certainly embraces the whole standing against appeasement theory. Darkest Hour is a soft focus portrait of a man far more complicated than it needs him to be, especially near the end when there is a sappy scene which has Churchill cry in pubic. Wright sets the stage for one of Britain's greatest actors, Gary Oldman, to give one of his career best performances. Oldman, under likely Oscar winning make up, gives a strong performance which not only transforms him into the famous figure but also allows him to give a layered and fascinating performance. Oldman gives Churchill a humanness required by the film. We can see him as a man as well as a legend. He gets to put on all those amazing speeches. The film spends a lot of time focusing on Churchill's power to inspire through his motivational speeches and Oldman makes the most of these. This is a bit of a "crown jewel" in Oldman's career. Darkest Hour is great film making. As with many great films, as history it leaves a lot to be desired. While I found much of the Churchill sentimentality hard to suffer, I found Wright's story telling to be quite up to snuff.